By my calculations, calculations made late in the day and built on a sleep-deprived foundation, I’ve now spent 66 days away from the high street- that marks a whoppin’ two thirds of the 100 day ban (insert feelings of accomplishment *here*) In those days, the season has changed to spring and, of course, London Fashion Week has sent a flurry of picture perfect new season Instagram looks my way. You’d expect me to be feeling the itch by now? Not yet. Not yet. 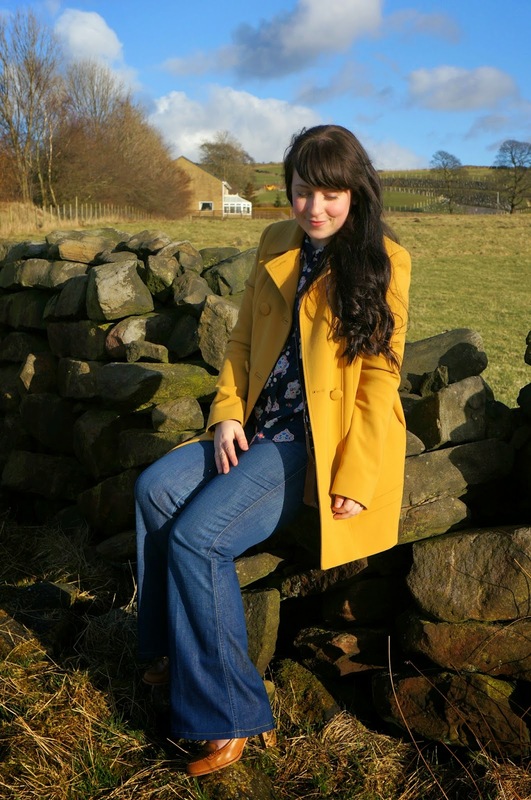 It’s all thanks to these amazing flared jeans I recently found which reignited my charity shop faith. 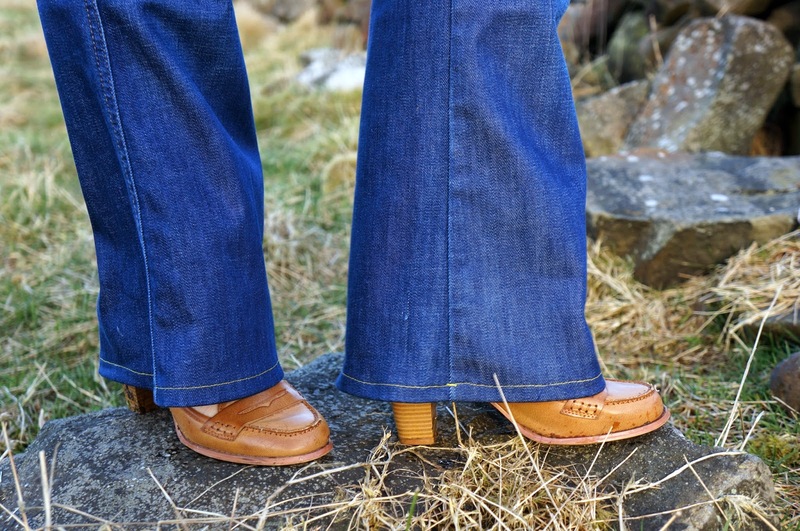 After seeing Alexa Chung sporting flares for London Fashion Week, I needed no excuse to add them to my wish list – it seems I’m drawn to the Seventies. So, on a recent, rainy Saturday afternoon, I chanced upon these Jigsaw jeans on the 50p rail. Yes, the 50p rail. Breathe. I’ve never found a pair of jeans in a charity shop, it’s difficult enough to find them on the high street. Despite being inches too long on the leg (typical petite problems), they were the perfect fit on the waist. And that’s when my lovely mother-in-law stepped in to help and hemmed them to fit my tiny legs, making these my favourite jeans of all time. 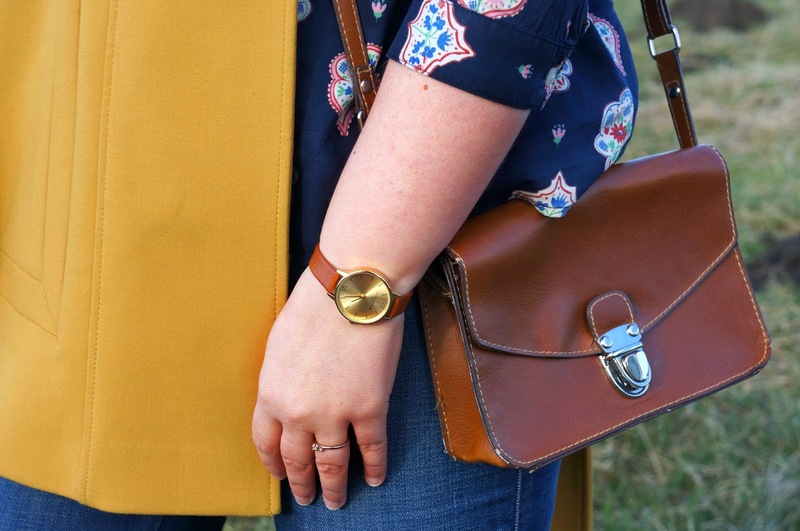 You may have noticed a distinct lack of jeans on the blog and there’s a reason for that, I hate my thighs. 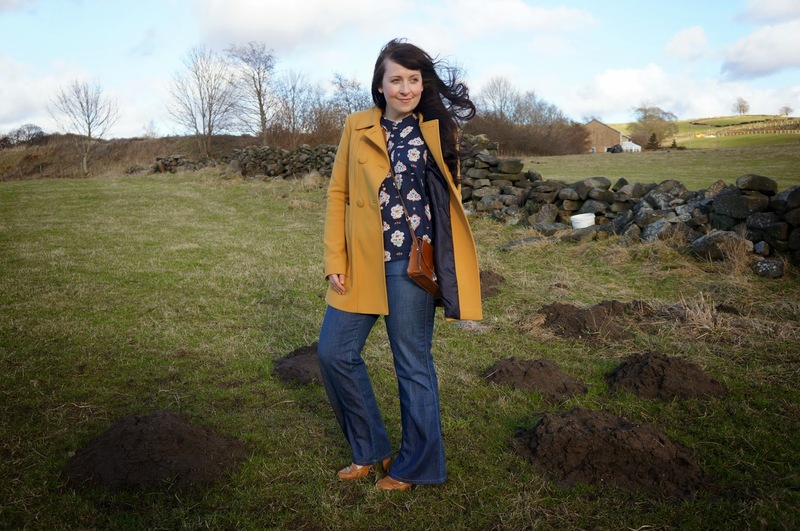 Who would have thought a 50p pair of jeans could have changed my life my opinion? And the bargains just didn’t stop there. Crossing the road, I spied these heeled tan leather loafers in the window of a shop supporting Greyhounds. Size 5, tick. Appropriately priced, cross. Can you believe they were just £2? Apart from a dink on the heel, they were in amazing condition and a perfect fit. All that was left for my Seventies transformation was to add my beloved Celia Birtwell for Uniqlo shirt. 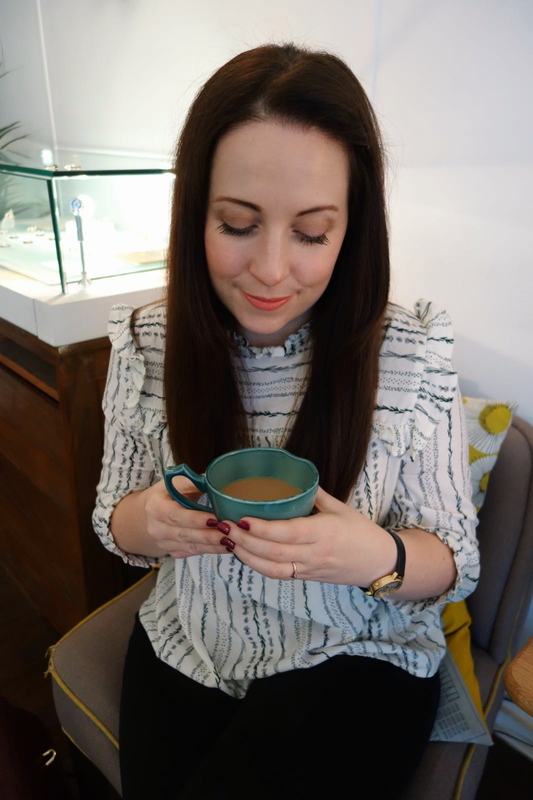 This year, I’m estimating that I’ve found around 25 items in charity shops. From shoes, to dresses, jumpers to skirts. It’s fair to say, I have plenty of clothes to show you in outfit posts. 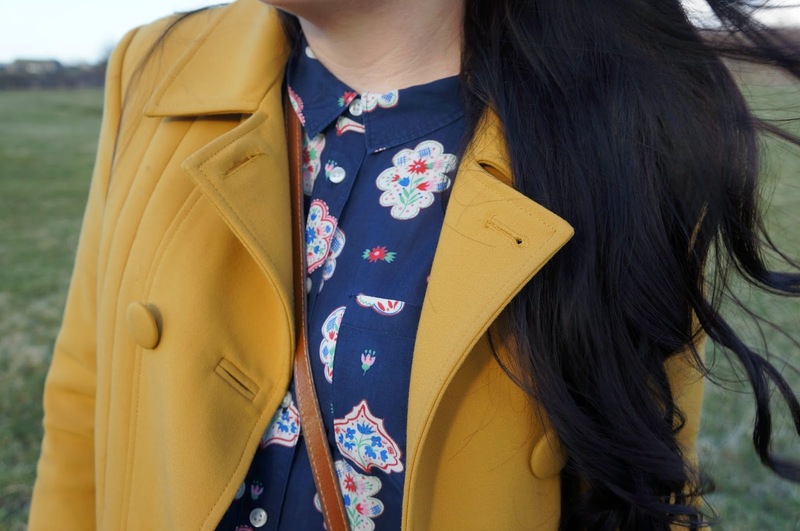 My thrifting hasn’t been easy, I’ve made a few purchases I regret, but being able to feature two finds in one outfit post makes me feel that I’m building a unique wardrobe which suits me. After all, I can afford to be creative and take risks, if I something isn’t right for me- I’ll simply donate it back to charity. So there we have it, a new spring look, a spin off of the Modern Seventies trend, all for £2.50. 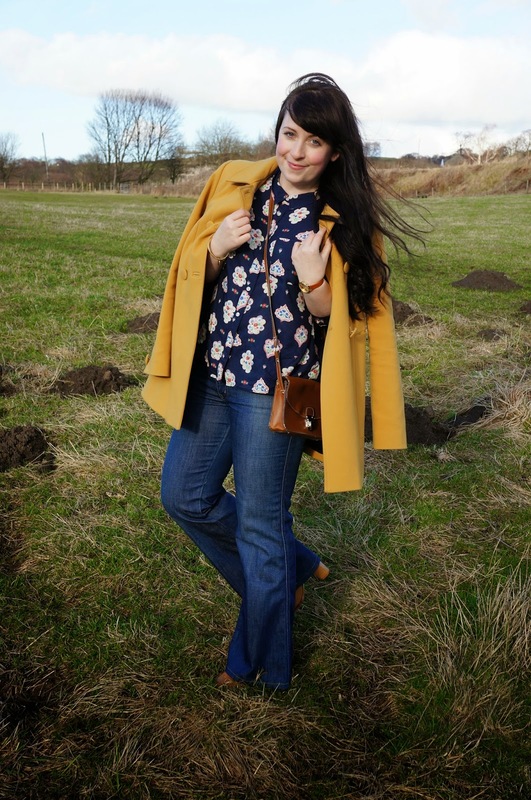 Are you a fan of the Seventies trend?